Something hugely important is happening in a vast, quiet stretch of the Northern Cape. A new radio telescope operating at just a quarter of its full power is revealing the universe’s secrets one image at a time. 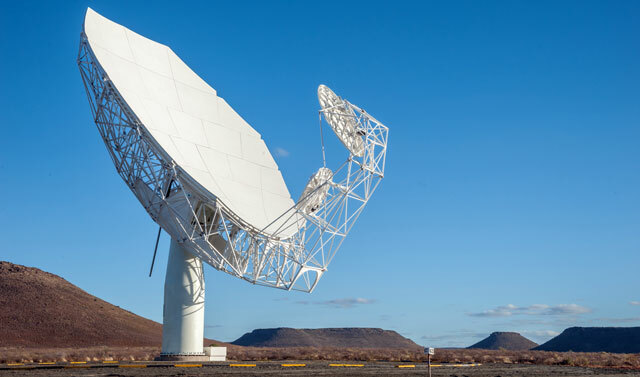 MeerKAT will ultimately become part of the Square Kilometre Array (SKA) telescope. Once it’s completed sometime in the decade following 2020, the SKA will be the world’s largest radio telescope. The project is shared between South Africa and Australia. It’s not just its size that sets it apart from other radio telescopes but also sensitivity and speed. At full power, the SKA will have 50 times the sensitivity and 10 000 times the survey speed of the best existing telescopes. It will see more, and see it faster. It can explore the universe and answer some of humanity’s biggest scientific questions – where there is life out there and how galaxies are formed. All of this lies sometime in the future. But already, MeerKAT is yielding remarkable results. MeerKAT currently comprises 16 dishes (of an eventual 64) functioning as a telescope array — a radio telescope works by effectively linking smaller dishes together and operating as one. These 16 dishes, known collectively as Array Release 1, recently embarked on their first assignment. It was an amazing start! 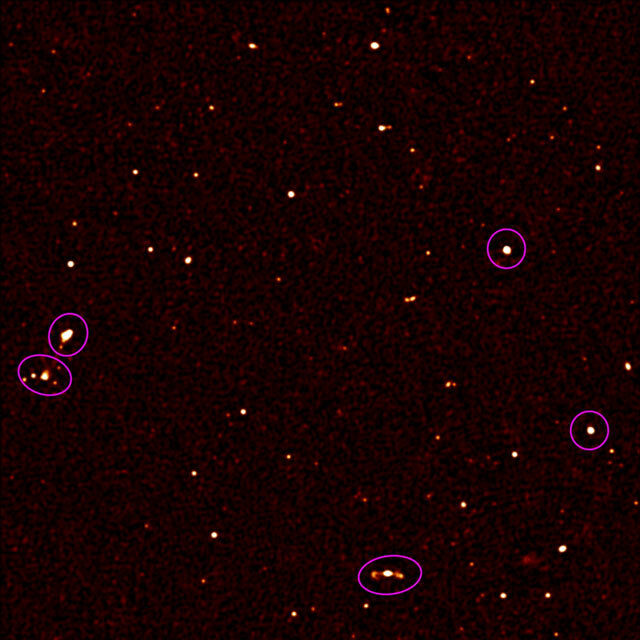 Array Release 1 found 1 300 galaxies in a patch of sky that was previously thought to contain only 70. That’s hundreds of new galaxies to be studied and understood, and greatly adds to our knowledge of the universe. In some cases, the radio galaxy can have a great deal of obscuring dust, and you wouldn’t be able to see anything — or almost anything — with an optical telescope. These “first-light” images are extremely exciting, whether for seasoned astronomers or ordinary people who crave more information about the world “out there”. There’s more than pure science to any project of this scope. It takes remarkable engineering to bring any radio telescope to life, let alone what will become the world’s largest. Each of MeerKAT’s completed 64 dishes will be 13,5m in diameter. The dishes are accompanied by a plethora of cryogenic coolers, receivers, digitisers and other electronic systems. It’s a challenge to get all of this equipment to work together in a fully integrated array. That’s why the telescope is being commissioned in phases: it allows any technical problems to be identified and resolved as early as possible. As the “first-light” images reveal, everything is functioning smoothly as the MeerKAT begins its sky-searching work. One of the important features of the SKA and MeerKAT is that it’s a massive, multinational endeavour. There are around 200 technicians, scientists and engineers working on the project. They come from all over the world and are collaborating with industry to build the technologies, hardware and software systems. It’s not just about the construction, though. Scientists are also getting the chance to test their theories using MeerKAT’s infrastructure. I am part of a team led by Prof Mario Santos of the University of the Western Cape involved in a large survey that will be conducted with MeerKAT. The team consists of scientists from South African and international institutions. Our goal is to do breakthrough cosmology and study the many new galaxies that will be detected. Recently, a new scientific technique called HI Intensity Mapping has emerged as a powerful and promising probe for cosmology with radio telescopes. It involves trying to map the universe’s neutral hydrogen content. MeerKAT provides an exciting opportunity to put this science to the test. We’re seeking an extremely weak signal, much weaker than the galaxy and the contributions that the instrument adds to the data. My recent work has involved demonstrating that you can “clean” out all these other contributions to access the very weak hydrogen signal. Once we’re able to locate this crucial signal, we’ll be able to understand much more about the universe. It’s not just those who are directly involved in the project who are excited about what MeerKAT has to offer. Just after Array Release 1, about 150 astronomers — two thirds of them from South Africa — met to discuss and update the MeerKAT science programme in Stellenbosch. Broadly, this programme will consist of two major elements. The first involves approved large surveys of the sky. These will peer into deep space; they’ll range from shallow and wide to deep and small, covering large volumes of space containing many, many galaxies. The images they’ll capture will deepen our understanding of what the universe contains, how it’s structured and how it works. The second element is open time: time reserved for astronomers to propose new and interesting observations that can then be conducted using MeerKAT. This encourages more research and could lead to even more of the universe’s secrets being revealed. The “first-light” images are just the beginning. Even at a quarter of its full strength, MeerKAT — and ultimately the SKA project — seems set to prove that the sky really is the limit for what we can learn about our universe.